This tutorial shows how to create an import to add new products and new suppliers to the Products and Suppliers table in one go. Note: this example uses several techniques and concepts which will usually be familiar to MS Access developers only: relationships, elementary VBA code. So this is not for the faint of heart. 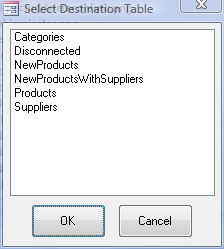 In the Relationships window we see how the Suppliers ( parent) and Products ( child) data are related. This schema requires for each NewProductsWithSuppliers record to first add a Supplier if it does not yet have a record in the database, followed by adding the Products records, using the newly created SupplierID. 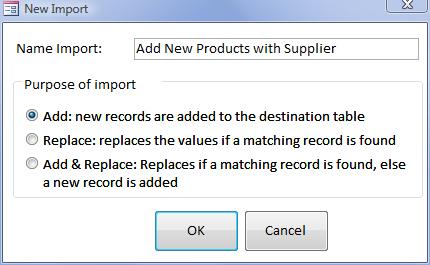 In the Import an Validate form the Select Source Table tab gets focus. After selecting the source table, the Select Destination Table tab gets focus. We now want to select the first Destination Table, in our case this will be table Suppliers. The Supplier must be known before Products can be added because of the parent-child relationship (referential integrity). In the Transfer Pane rows appear for the Suppliers destination table. You will notice there is initially no match with the Supplier. The reason for this is there is practically no overlap between the Suppliers table and the NewProductsWithSupplier table. set the [UseOldValue] on the CompanyName row (on the complete right). To find what is the SupplierID of a company, we use a simple Visual Basic function (VBA), applied to the supplier's CompanyName. The New Value field again gets the name of the company. This time however, it turns orange. This indicates the value is not acceptable. The reason is only numeric values are acceptable for the SupplierID field. We will fix this by making a function that looks up corresponding SupplierID. A column 'Evaluate' appears next to the Source column. The selected cell gets filled with a VBA function call 'Supplier_Evaluate([Source])'. The purpose of this call is to pick up whatever [Source] returns as a value (in our case the CompanyName), feed that value to the function Supplier_Evaluate and put the result in the New Value cell. In the Access VBE (Visual Basic Environment of Access) the function has been added. It is now your task to change the dummy function that was automatically created into one that looks up the Supplier ID corresponding to the Supplier companyname. Press Alt-F11 to open the Access VBE. If all's well, you should now see the SupplierID appear instead of the CompanyName in the New Value column. Finally, we may remove the unused rows: all rows starting from Contact Name. They don't play a part in the current import. See Remove unused rows from the Transfer Pane. We now want to select the second Destination Table, in our case table Products. In the transfer pane, an again matching is done of Source and Destination fields. Note that on row 231, the Source column value is 216.Suppliers.SupplierID. This tells the program to pick up the New Value of line 216. In case a new Supplier is added, the newly created SupplierID is automatically picked up and used to link the added new Products. Switch to tab Start Import. The record was added, the next record was selected. If you open table Products, you will see 'Vegie-spread' was added. Close the table again. The records for the new supplier and product were added, the next record was selected. If you open tables Supplier and Products, you will see 'New Kid on the block' and 'Tofu' were added.